Little did I realise when signing off my last entry here that an idle threat to get to grips with immature gulls would prove to be quite so prophetic. Perhaps I should explain. This morning was, as the Scottish like to put it, rather dreich. It's a word I love and one that roughly translated means wet, cold and gloomy. Perhaps as a good blogger I should have taken a photograph to illustrate the rain streaming down our bedroom windows behind which lay cloud cover at almost ground level, but in truth the energy just couldn't be mustered as once again the prospect of a dry weekend was snatched from my grasp. Then a miracle. Those same strong winds which had been howling through the eaves all morning finally managed to put their energy towards something useful and blew the latest front off to the east. Behind it came a clearing sky and, most amazingly of all, some sun! Quick as a flash we were out of the house and on our way to Port Eynon where a quick scan of the bay revealed what at first seemed to be nothing more than your bog standard flock of gulls. 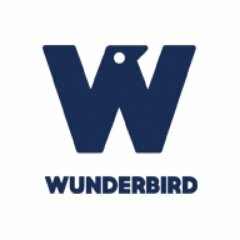 In truth I dismissed them almost immediately being not one of the frankly sadistic bunch who love picking over this fiendishly troublesome bird group, so hats off to Emma for sticking with them and spotting two birds which looked distinctly different from the rest. I was soon onto them and together we noted the dark under-wings (unusual), small black beak and red legs. At the back of my mind a Little Gull identification was screaming to get out and after a perfect size comparison with nearby Black Headed Gulls that's exactly what we got. I've only seen this species once before and that was at very close range on Sandy Water Park, so to pick these out in the 'wild' was an achievement indeed. We stopped short of a victory jig though our excited chatter probably seemed at odds with conditions which were once more getting darker by the minute. There was little time for self congratulation however before another mystery gull reared its head. This time there was extensive black marking on the upper wings and another black beak as I struggled to move away from a possible Bonaparte's Gull. Again this is a species that I've seen a couple of times previously but never self found so in truth I had little more than memory to go on (never leave your bird book at home!). Indeed we were all but convinced until an adult Kittiwake drifted through the scene showing us the error of our ways. 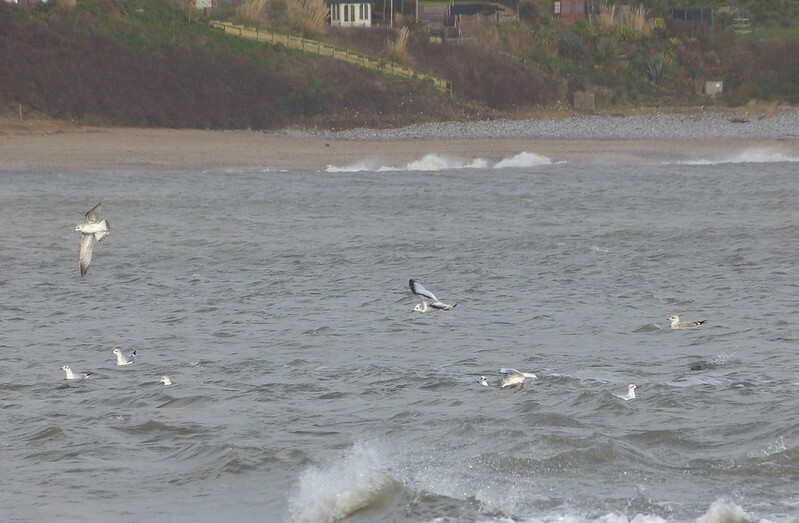 Of course it was a first winter Kittiwake and probably one of the birds from the breeding colony at Mumbles. I can't deny feeling a slight pang of disappointment when, as if on cue, a heavy squally downpour arrived to teach me a lesson for being so ungrateful. There was just time to fire off a few record shots with the camera before heading for shelter against the ruined Salt House. Once calm had returned, and with it some more of that precious sun, we set about relocating the Little Gulls. The two adult winter birds were quickly found along with the Kittiwake when all of a sudden I began to see double. 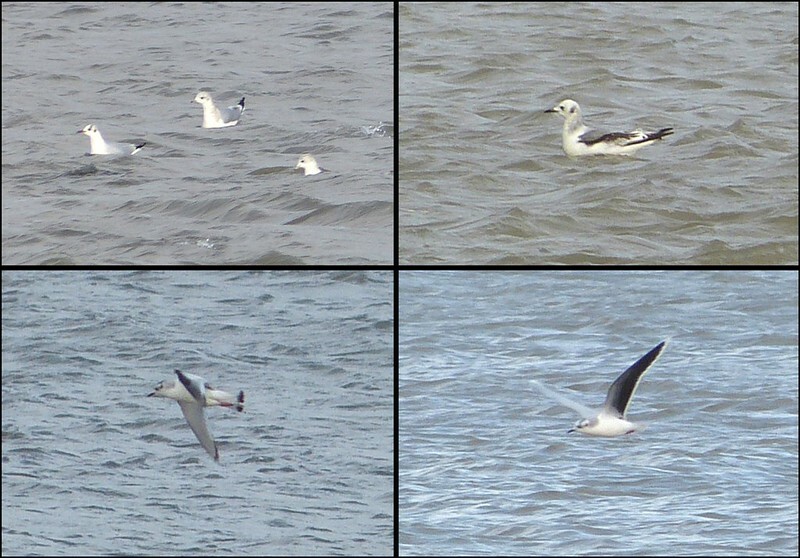 What looked like another juvenile Kittiwake had now joined the scene but appeared to be half the size of the first. A degree of head scratching followed before we realised that we were looking at a first winter Little Gull. The leading black edges to its wings and black tipped tail were dead giveaways (now that I've consulted the reference books) making it a rather nice trio. As you can imagine things only got better with the arrival of a third adult winter bird giving us four Little Gulls feeding together. That felt slightly special to put it mildly. Needless to say I'd have loved to get some decent photographs but distances were simply too great and with hands like blocks of ice even holding the camera steady against the wind was an almost impossible task. The best I managed were a few grainy shots, the best of which are shown heavily cropped below. Little Gulls definitely topped the days rarity scale but there was plenty of other action happening all around. At least three Mediterranean Gulls, several Common Gulls and plenty of Black Headed Gulls made up the rest of the flock above while out towards Sedges Bank a trio of Great Black-backed Gulls were also present. From that direction came a very decent flow of waders as the tide began to drop including the resident Little Egret, numerous Oystercatcher, seven Turnstone and a flock of at least forty Ringed Plover. Singles of Redshank and Curlew added to the menagerie prompting us to take a closer look. The walk over was distinctly rockier than I remembered it due in part to loss of material during the winter storms. A sheltered spot wasn't too hard to find though and we were soon enjoying close views of a Shag fishing just offshore. Surprisingly small compared to their more locally common relative the Cormorant it was another surprise treat from a day which had initially promised so little. 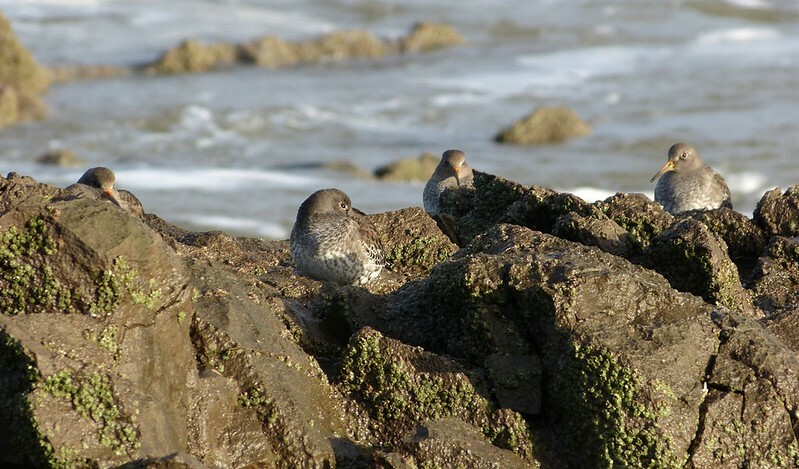 Better was still to come though in the shape of seven Purple Sandpipers which flew in and landed not far from our position. I almost didn't bother moving in for some photographs but another appearance by the sun soon had me crawling across sharp rocks. Fortunately I think the results were well worth it. 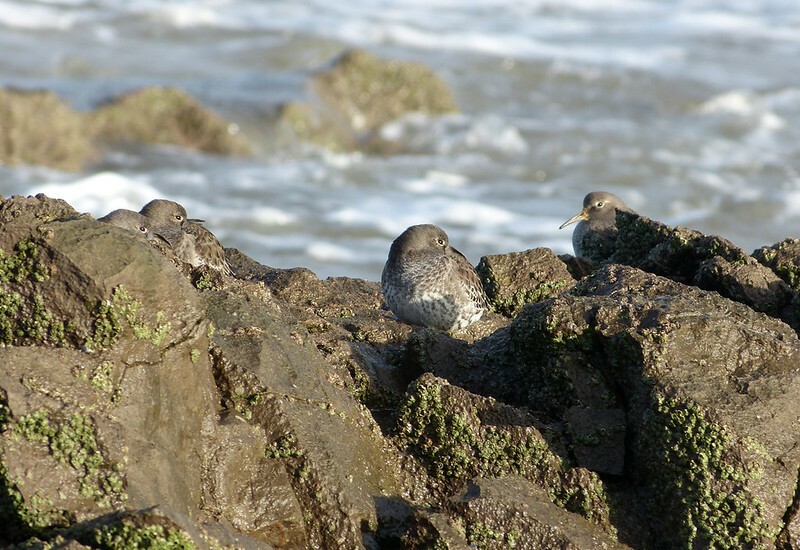 If I remember correctly these are my first Purple Sandpipers on Gower for a couple of years and as usual they were delightfully approachable. When mixed in with Turnstones they can be notoriously flighty but find them alone and it's hard not to get something worth keeping. And with that it was back to the car before the next rain shower had chance to drench us once again. Considering the way the day had started I could not have imagined a more different afternoon. Birding in 2014 is definitely off to a flying start. Two very nice species in one post. I got to see Little Gulls very close up in Finland, they are a very smart bird. A great series. Lovely to see the rocky coast. I love the shots of the purps, and very envious. Great shots. 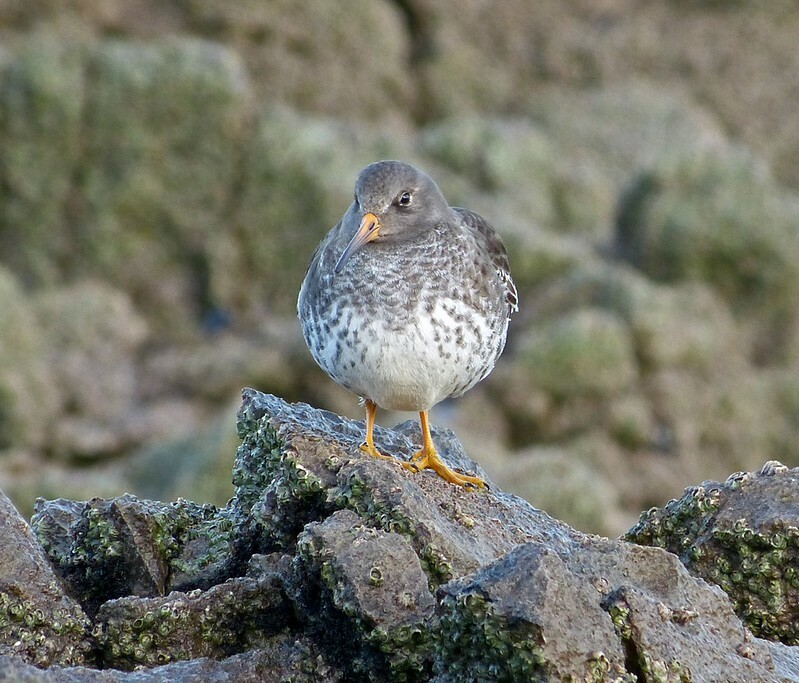 Really love that last Purple Sandpiper. Very jealous of that one. Managed to see my first last week at Colwyn Bay.